Established in 1998 with over 25 years of experience in the industry, D.A.S Decorating has built a successful reputation for being a reliable painting & decorating service. Operating out of Eastleigh, Hampshire, D.A.S Decorating offers a wide array of services from Exterior/Interior painting to coving. We offer high quality painting and decorating works internally and externally in the domestic and commercial sector using the highest quality materials available. We can offer advice and recommend the best materials for your project. We are fully insured and can guarantee all works carried out. 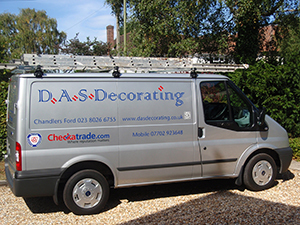 D.A.S Decorating is a family run business which always puts the customer first. By offering free quotes and advice with competitive prices, D.A.S Decorating receives a lot of work from repeat recommendations in the local area.